Authors are invited to submit manuscripts reporting original, unpublished research and recent developments in Computational Sciences. All accepted papers will be included in the open-access Procedia Computer Science series and indexed by Scopus, ScienceDirect, and Thomson Reuters Conference Proceedings Citation (former ISI Proceedings) – an integrated index within Web of Science. The papers will contain linked references, XML versions and citable DOI numbers. 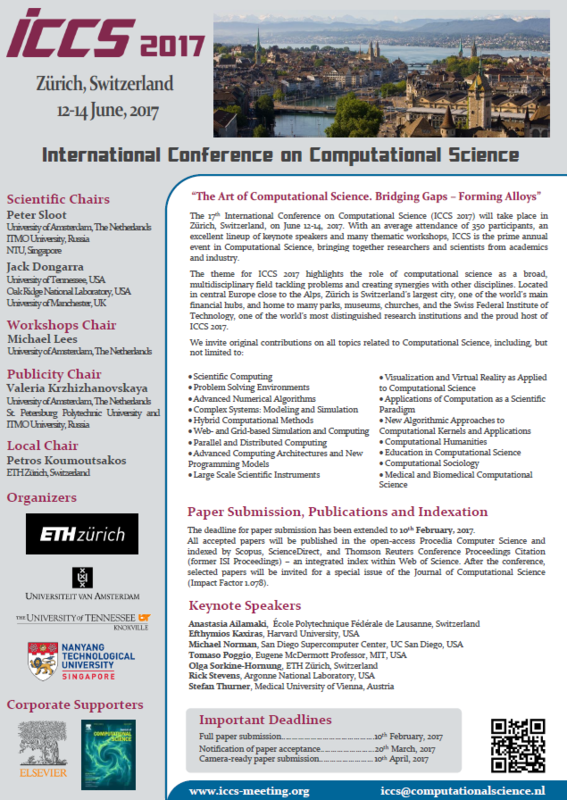 As the conference theme this year is “The Art of Computational Science. Bridging Gaps – Forming Alloys”, papers highlighting the role of computational science as a broad, multidisciplinary science tackling problems and creating synergies with other fields will be particularly welcomed. The manuscripts of up to 10 pages, written in English and formatted according to the EasyChair templates, should be submitted electronically via EasyChair. Templates are available for download in EasyChair horizontal menu “Templates”. Papers must be based on unpublished original work and must be submitted to ICCS only. Submission implies the willingness of at least one of the authors to register and present the paper. Deadlines for draft paper submission, notification of acceptance, camera-ready paper submission and registration may be found in the Important Dates section. You are welcome to participate in one of the thematic workshops or in the Main Track (if your topic does do fit any workshop but still falls within the scope of the conference). During submission, you may select either a “Full Paper” or a “Abstract Only” publication. By default, it would be an oral presentation. If you prefer to present a poster, please check the “Poster Presentation” option in the submission page. While we encourage full paper submissions, the “Abstract Only” option caters to researchers who can only publish in specific journals or work for companies in circumstances such that they cannot publish at all, but still want to present their work and discuss it with their peers at ICCS. In the “Abstract Only” option, a short abstract is published in a book of abstracts, but not in the Procedia Computer Science.